Today, I needed chocolate. Not milk chocolate, but dark, intense chocolate. To get my fix, I whipped up some chocolate chip pancakes (using Ghirardelli 60% cocoa chips). Oh… these were just what I needed!! To make it even more interesting I added blueberries. I could have added some walnuts since I had them in the cabinet, but I wanted more chocolate and soft chewiness in each bite. These pancakes are whole wheat. Now, don’t let that scare you off, if you’ve never made whole wheat pancakes. It doesn’t take away from the taste, in fact, I think it makes it better. I love cooking with whole wheat flour. The texture really works in this too. Serving size: about 6-7 pancakes. 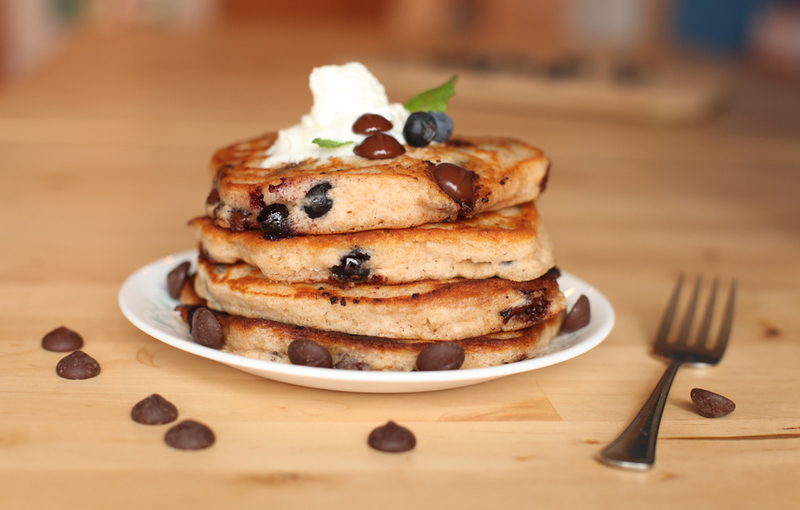 Fluffy, rich and thick chocolate and blueberry whole wheat pancakes. Sift together flour, salt and baking powder in a large bowl. Make a hole in the middle of dry ingredients and pour in milk, melted butter and egg. Mix together then add chocolate chips and mix until blended. Gently mix in blueberries. Don't over-mix batter. Some lumpiness in the batter makes for fluffier pancakes. Heat 1-2 teaspoons of oil or butter on frying pan and pour batter into pan. When tiny bubbles begin to appear in the pancake, flip it over. Continue until all batter is cooked.